During a weekend in Florence, I decided to treat myself and got to a lovely bio (European for organic) vegetarian dinner at La Raccolta in Florence (Firenze), Italy. 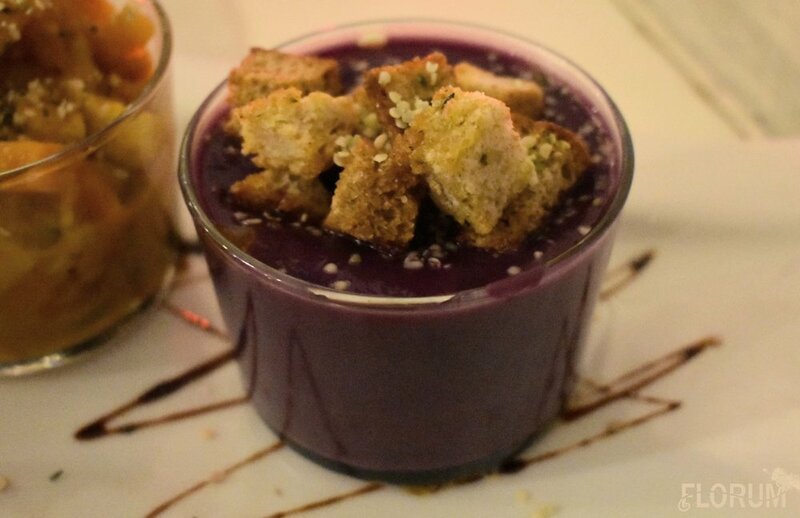 I found the vegan restaurant on Tripadvisor and could not have been more happy with the natural healthy dishes, biodynamic wine, vegan desserts, and of course the ambiance of the restaurant itself. This quote from Charles Darwin is one of my favorite reminders on why leaving animal products out of our diets is ethical, sustainable, and the compassionate choice. 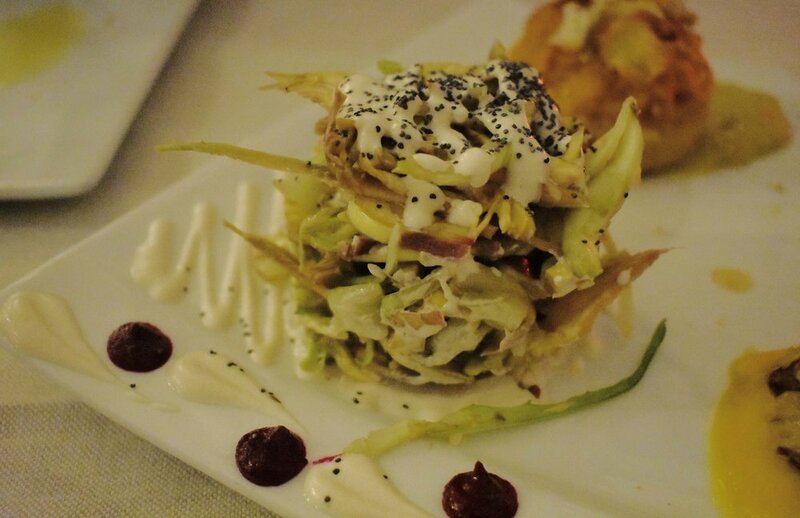 La Raccolta in Firenze was an obvious choice when searching TripAdvisor for a vegetarian or vegan restaurant. From the bio vino I sipped on, too the savory 'farm to table' dinner and vegan dessert I am still dreaming of, La Raccolta is a must for any vegan, vegetarian, pecatrarian, paleo, health conscious or envirmentally concious individual. Due to my visit being in the evening, I wasn't able to get the best photo of the outside of the restaurant. However you can see from the sign that faces the street, that La Raccolta is bar, ristorante, natural market, and bio vegetariano. So if you find yourself in Florence and looking for the restaurant, you shouldn't be able to miss it (if you keep an eye out for the sign)! And if you would like the full article, be sure to scroll down to the bottom of the page to get the address ( as well as the pinpoint of google maps). Being from California and having Napa Valley so close to my hometown of San Francisco (I know I am spoiled), I must say that a delicious glass of wine at dinner is a treat I love to indulge in. The selection and option of bio wines at La Raccolta was wonderful and included vino from all around Itlay (including Tuscany, Piedmont, Sardinia, and many more). I ended up selecting a Tuscan bottle from a winery called Ampelelia di Sopra. At first glance the varietal of grape was one that I had not heard of before, called Alicante. However after entering the bottle into my wine app Delectable, and doing a bit of research on EcoSia (EcoSia is the internet search engine that plants trees everytime you search for something) bit of research I came to see the Alicante was the Tuscan name for French Grenache, Sardinia Cannonau, or Spain Garnacha (always fascinates me how one varietal of grape can have so many different names in different places around the globe). Eating with a friend at La Raccolta, meant that we had the option to choose the 'The Collection.' This dinner option is meant for two people and costs €45 for 6 tastings from the seasonal dinner menu, you can choose to eat according to the chef's fantasy (or choose two starters of your own, followed by two prima choices and ended with two second course choices of you desire). At first glance, you may not realize that the purple looking flower atop this dish, is actually an edible vegetable. The sample of a curry dish was as delicious as the presentation. The vegetables were so tasty and fresh, it was without question that they are seasonal becuse they are buying from local farmers. Soup is one of my favorite foods, since it is so versatile and can be made with almost any organic vegetables and can be easily vegan. Of the taste of six dishes, this sweet potatoe soup was in the top three of the six dishes. The pumpkin curry pictured above was so lovely and had such a wonderful balance of seasonings, I would 100% order this again on my next visit if its the right season and on the menu at La Raccolta. My favorite dessert of the two I tried was the vegan cheesecake (with chocolate top layer and drizzle) ricette dolci. Of all the desserts offered I was told this was a vegan version of a traditional italian dessert cake. If your visiting La Raccolta for dinner, lunch or shopping in their little organic market, I suggest you pick up a slice of this vegan sweet treat (I'm regretting not going back for a 2nd taste before leaving Florence and heading back to MIlan, Italy. The vegan tiramisu was absolutely divine and honestly such a surprise to come across since it is traditionally made with dairy. The bio market at La Raccolta was full of beautiful biodynamic and organic wines from around Italy. If you are wondering what a Biodynamic wine is, check out my post on biodynamic winery Rex Hill in Oregon HERE. 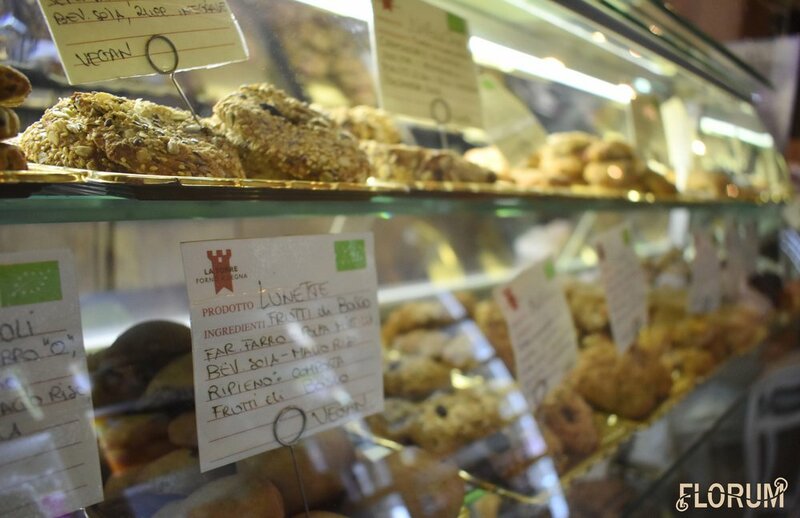 If you don't have time to eat at the restaurant La Raccolta in Florence, Italy be sure to stop by the bakery for some amazing vegan pastries and traditional Italian baked treats. If you still need some more information (aka another opinion) that this restaurant is worth your time, I suggest checking out Ali Seiter's write up via her blog 'Chick Peas + Change' on La Raccolta from 2014 (before they remodeled) and you'll see that this restaurant has the history of quality, consistency and taste.